Not everyone is a professional web developer who are able to use a complicated software such as Adobe Flash to customize their templates. IncrediFlash Website Template comes with a free Editor to customize your template. It is designed with ease of use in mind. 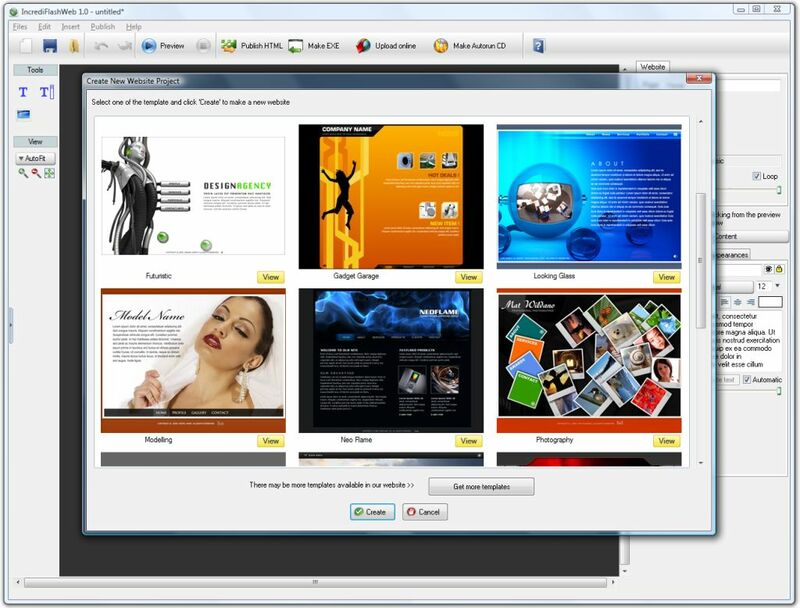 You do not need any previous multimedia/website development skill to use it. A standard customization process only takes approximately 5 minutes. IncrediFlash Website Template can be publish into a Flash and HTML file, exectuable file and an autorun CD-ROM (electronic business card). No other flash website template offer this many publishing possibilities. ApPHP Survey - ApPHP Survey is a fully featured web solution allows non-technical users to create create surveys and polls, send them to anyone, administer them, gather results, and view statistics, all managed online after database initialization. uHotelBooking web reservation system - uHotelBooking is a powerful hotel management and online booking/reservation site script. This script is the fully functional PHP solution to manage small to medium size of hotels, holiday flats or guesthouse. ApPHP Restaurant Site - ApPHP Restaurant Site is restaurant menu website and and site management online solution for restaurant or food related services. Our script allows you to start your online restaurant business or upgrade your existing in minutes. AdiInviter Pro Tell A Friend Script - The Ultimate Contacts Importer And Tell-A-Friend System For Your Website. Import contacts from email accounts, social networks and lot more.. Gmail, Facebook, Twitter, Linkedin, AOL, GMX, iCloud, Outlook, Yahoo and many more..
Events Module for Directy CMF - The Events Module allows administrator to create and manage different types of reports, display them in calendar preview on Frontend. This module provides possibility to create event's categories and display events on the site. DzSoft PHP Editor - DzSoft PHP Editor is a handy and powerful tool for writing and testing PHP and HTML pages. With its deceptive simplicity, it's interface is comfortable both for beginners and experienced programmers, making PHP development easy and productive. CMS Module for Directy CMF - CMS module provides you with a basic functionality of content management features, like: creating and editing pages, defining meta tags for the specific pages, deleting them, etc. It allows also to use short-codes defined by the system. Directy CMF - ApPHP Directy CMF is an open-source content management framework (CMF), built on ApPHP MVC Framework that provides a basic functionality required for creating websites and publishing web content. PHP Events Calendar Control - The ApPHP Calendar is a powerful PHP calendar script that may be easily integrated and used with various PHP projects, such as schedulers, event processors etc. The calendar is very simple to install, implement and use.